new Flight of the Conchords self titled full-length album drops April 22nd. Go listen to the "Ladies of the World" track from the record. And - new series (2) of Flight of the Conchords begins January 9(ish). Season 1 is on sale now! Help me name my fanmix! *Sorry in advance if this isn't allowed. 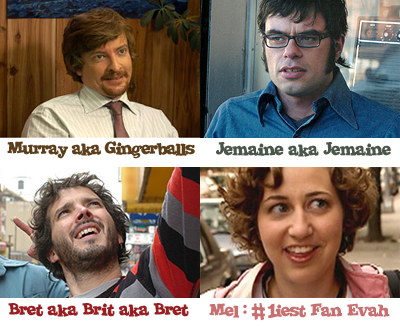 Hi all, I'm working on a Bret/Jemaine fanmix, and I'm stuck trying to name it. Jemaine Layout for the ladies! Hey there! This is my first post but I would like to share with all the Jemaine fans, a custom layout! If you decide to use it and need any help installing it, just comment here! Layout style: Generator for all. Please credit in your info if you use it, thanks. when FOTC first appeared on conan o'brien's show a few years ago, were they interviewed after they performed? I'll take one of everything. Just got word of this! FOTC has been renewed for a second season! Mothaflippin' awesome! Also, Bret gets a mention in today's Gawker Stalker. Please, if you have not already, check out the completely UNofficial conchords' fansite: conchords.net. It's offically an awesome resource. And how about last night's episode? Jemaine's outfit! "Casual Prince." HOT. to my favorite Conchords' site, What the Folk? for noticing us here in LJ-land. Hi kids - just a note to say that the boys are going to be on Letterman this Friday, and they're in this month's Interview magazine. It's only a one-page thing, and if I had a scanner I would show it to you. So has anyone see this yet? I personally live in black hole land and am anxious to hear what any of you think, who may catch it in theaters. There's a little short behind the scenes thing about FOTC on HBO right now...it's something that they show between movies so I guess there's no way to know when it's coming on. Anyway, look out for it!